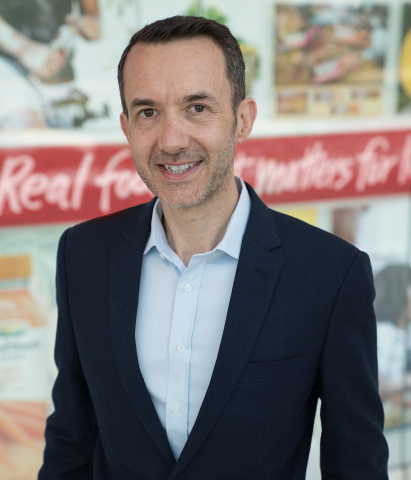 CAMDEN, N.J.--(BUSINESS WIRE)--Campbell Soup Company (NYSE: CPB) today announced the appointment of Diego Palmieri as Vice President and Chief Marketing Officer, U.S. Meals & Beverages, effective July 18, 2018. Diego will report to Roberto Leopardi, President, Meals & Beverages. As Chief Marketing Officer, Diego will be responsible for all aspects of marketing and consumer connection in the United States across the division’s portfolio of brands, which includes Campbell’s, Chunky, Well Yes!, Slow Kettle, Swanson, V8, Plum, Pace and Prego. Palmieri joins Campbell from SC Johnson, where he spent more than two decades in various business roles and nearly half his career in marketing. He was most recently general manager of the company’s Greater China business (China, Hong Kong and Taiwan). In this role he built the company’s entire e-commerce capability in China. Previously, he managed the Glade Home Fragrance business for all international markets and led the successful US acquisition of The Caldrea Company, including Mrs. Meyer’s, the fastest growing brand in the natural cleaning space. He also led the marketing for brands including Off! Repellents and the Pledge Grab-It electrostatic duster line. Palmieri began his career at Sanyo Electric Co. and then Nestlé Argentina where he managed the Maggi soup and bouillon business. Palmieri earned his MBA from the Duke University Fuqua Business School and his undergraduate degree from Buenos Aires Institute of Technology in Argentina. Campbell (NYSE:CPB) is driven and inspired by our Purpose, “Real food that matters for life’s moments.” We make a range of high-quality soups and simple meals, beverages, snacks and packaged fresh foods. For generations, people have trusted Campbell to provide authentic, flavorful and readily available foods and beverages that connect them to each other, to warm memories and to what’s important today. Led by our iconic Campbell’s brand, our portfolio includes Pepperidge Farm, Bolthouse Farms, Arnott’s, V8, Swanson, Pace, Prego, Plum, Royal Dansk, Kjeldsens, Garden Fresh Gourmet, Pacific Foods, Snyder’s of Hanover, Lance, Kettle Brand, KETTLE Chips, Cape Cod, Snack Factory Pretzel Crisps, Pop Secret, Emerald, Late July and other brand names. Founded in 1869, Campbell has a heritage of giving back and acting as a good steward of the planet’s natural resources. The company is a member of the Standard & Poor’s 500 and the Dow Jones Sustainability Indexes. For more information, visit www.campbellsoupcompany.com or follow company news on Twitter via @CampbellSoupCo. To learn more about how we make our food and the choices behind the ingredients we use, visit www.whatsinmyfood.com.